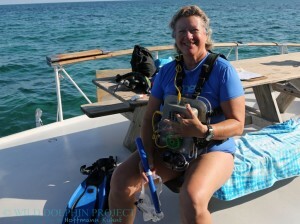 The CHAT society is a Director's circle comprised of the Wild Dolphin Project's strongest supporters. CHAT Society members will have a front row seat, while enabling Dr. Herzing to focus on her groundbreaking interspecies communication research within Wild Dolphin Project and engage interdisciplinary colleagues in this cutting-edge research. When you join us as a member of The CHAT Society, you will have exciting opportunities to be involved with the communication research and access to our scientists. To thank you for your invaluable commitment to our work, you will have special opportunities for updates and interaction with our scientists and fieldwork normally reserved for members of the scientific community. 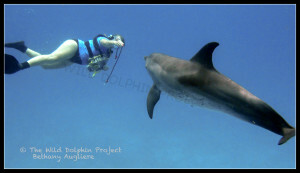 Decoding natural dolphin communication signals including acoustic and visual behaviors. 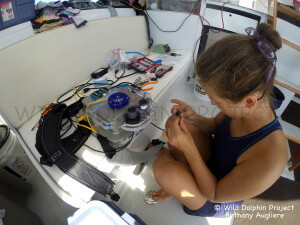 Developing a two-way acoustic interface using an underwater wearable computer to explore human-dolphin exchanges and dolphin cognition (CHAT – Cetacean Hearing And Telemetry). Exchanging ideas in a series of workshops and meetings with other working scientists in various fields. 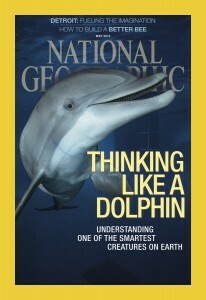 In 2010, the Wild Dolphin Project joined forces with Georgia Tech computer scientist Dr. Thad Starner and his team to embark upon cutting edge work in animal communication. New computer tools and methods are available to finally look closely at the elements and complexity of animal communication signals. Because of the overwhelming public interest in this subject, we are creating opportunities to help fund and support this research. Our vision is to make the exploration of nonhuman animal communication a reality and a strong scientific field of study. We hope to inspire you through this cutting-edge innovative work to help illuminate the complexity of other minds on the planet. To kick off this campaign, we are offering Founding Member Status for early supporters of the CHAT Society. The benefits are equal to those of Level I Status at a reduced price for those members who begin their support in 2015. Advance notice on biannual lectures/open houses in Atlanta and Florida and VIP opportunities. Annual "chat about CHAT" call, skype/google hangouts, with updates from Dr. Herzing and Dr. Starner. Opportunity to join the CHAT Society Advisory Board. 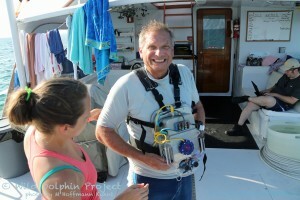 Day trip onboard Research Vessel Stenella, in Florida, with private updates by researchers. Annual access to a 10-day CHAT research trip during our regular field season with Dr. Herzing and/or Dr. Starner. These trips are closed to the public and will offer our supporters an unprecedented close-up of this cutting edge work. Private dinner with Dr. Herzing and/or Dr. Starner, as well as other Level 3 members, for intimate update of work (to be held in conjunction with biannual lectures/open houses in Atlanta or Florida). Private meetings or updates on request. For specific endowment opportunities, such as sponsoring a graduate student for a year, or a field season, please contact us directly. Email info@wilddolphinproject.org. Membership donations can be made as cash donations or stock donations of equivalent value. Celeste Mason, a member of the Georgia Tech team, disassembles and maintains a CHAT box in the field. The salty underwater ocean environment is a harsh place for a wearable computer and the Georgia Tech team works hard to keep the CHAT boxes functioning.